How much things change in a year! A year ago this blog did not even exist. I was still wrapped up in the excitement of unleashing my inner Angry Asian Buddhist onto the blogosphere. Who knew the party would go on so long? On the other hand, there are many things that barely change at all. For example, look at how few bylines continue to be set aside for Asians in the The Big Three publications. (And by Big, I’m talking about distribution.) Below I present the aggregate results for 2009. The Asian Meter developed out of a play on the Buddhist community’s fascination with the U.S. Religious Landscape Survey by the Pew Forum on Religion and Public Life. The Pew’s Buddhist numbers were questionable largely because of flawed assumptions about the Asian American community—like how many of us are out there. And without any attempt to validate the numbers, Buddhist publications chose to take them at face value. I decided to run the numbers on the periodicals themselves. There’s no special magic behind the Asian Meter. The metric is a simple quotient of Asians. Originally I looked at the proportion of writers of Asian heritage in a given publication. These days, I focus on the proportion of bylines allocated to writers of Asian heritage. There are different benefits and drawbacks to this shift in methodology, but I don’t care to talk about it—that’s what the comments section is for! My precious few readers probably prefer the graph. 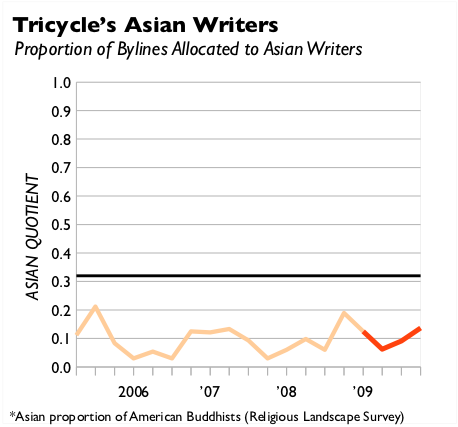 Tricycle remains the laggard, with nearly half as many Asians in its pages as the pack leader, Shambhala Sun. I’ve taken the liberty of combing back through several years of issues, only to find that Tricyclists stick to the habit of, on average, setting aside just one out of every ten bylines to an Asian brother—and sometimes an Asian sister. To get an idea of what I see when I look at the authors in Tricycle, an area graph tells a better story. Consider that we probably make up at least half of the Buddhist community. We speak English! We are Americans! Let us in! Here’s to positive changes in 2010! Sabbe satta abyapajjha hontu! Is it just blatant racism, or are there other factors? How many Asian writers have submitted material/applied for positions at The Big Three? How do they source their writers and material? @Adam: Thanks for your question. You’re far from the first person to ask, and as other commenters with experience in the publishing industry have also given their two cents on this issue, your question is definitely worth responding to in another post. I’d like to point out that I do not in any way believe The Big Three editors are racist in the sense that they have a formulated policy of excluding writers because they’re Asian. The phenomenon here is often termed “institutional racism”—one where the individual actors do not deliberately promote segregation, and yet segregation occurs as though they had been. I’ve blogged about this phenomenon before. As I mentioned, I intend to devote a post to addressing your more specific question about Asian submissions. Below I’ve repasted some thoughts from a previous post so that you can get a sense of my perspective. My criticisms have generated a lot of response before, and my favorite comments are the ones that blame the Asians. It’s the fault of Asian Americans because they aren’t submitting their work. Or maybe it’s just the case that there actually isn’t any Asian American writing worthy of a magazine as prestigious as Tricycle or Shambhala Sun. These are valid retorts, but their assumption is that there’s something wrong with Asians, not with the institutions. A football analogy may help put the issue into perspective. About 70 percent of players in the NFL are black. But in 2002, only 6 percent of head coaches were black. Maybe it was the case that black Americans weren’t applying for the top jobs. Or maybe it was the case that there actually weren’t any black Americans worthy of serving as head coaches for an institution as prestigious as the National Football League. Well, in 2003 a watered-down affirmative action program known as the Rooney Rule was instituted. In short, the rule is that for any head coach position, you have to interview at least one minority candidate. By 2006, the number of black coaches in the NFL had more than tripled. In order to compile your graph/information, you had to make a judgment as to whether someone is Asian or not. What was your criteria or standard? Was it their name or their skin color or their looks? Or some other basis? What makes someone sufficiently "Asian" to satisfy your standards? I understand the NFL comparison, but I (my judgement) would say that the reason there were so few black coaches was almost exclusively racist. The NFL was a good ol' boys league (and still is to some extent) and it was just assumed that you needed a white coach. A black coach could never make it. Then black coaches became more marketable, and teams that hired them didn't suffer the consequences of not filling seats or loosing their fanbase. So while I agree about "institutional racism", I still need more information about the Buddhist publications to make any kind of assumption about anything. Also, I wonder, what is your intent in publishing these numbers? To keep going with the NFL analogy, we might also assume that the lack of Asian editors among the 'big three' Buddhist publications may also account for the non-proportional representation of Asian Buddhist authors in those publications. Those three publications also cater (probably unconsciously) to a primarily white audience, though I think they've made some nominal attempts to diversify their readership over the past few years. I used to be the associate editor and (for a couple of issues before I was layed off) the senior editor for Turning Wheel, the Buddhist Peace Fellowship's journal. I think we might have done a little better in featuring Asian/Asian American Buddhist authors, but we could have stood a lot of improvement as well. Probably our best effort was the Fall 2000 issue which was dedicated to articles by Buddhists of Asian descent in the U.S., with Mushim Ikeda-Nash as the guest editor. Unfortunately, Turning Wheel seems to have fallen off the map the last couple of years. And so on we go... thanks for raising awareness of this issue. As the white Dharma Teacher of a mixed Asian America/non-Asian American sangha, I would definitely like to hear from more Asian American leaders in the American Buddhist community, or truthfully other POC American Buddhist leaders. Everything we read about Buddhism is either from the perspective of white converts or Asian "missionary" teachers. And now how many generations later we are going to have an Avatar movie with fake Asians?! WTF? Arun - you rock! Don't stop! My apologies for taking so long to respond to comments. As a more general note, although I frame this issue in terms of Asian versus non-Asian, the reality of the larger American Buddhist publications is that People of Color are together much less represented than their numbers in the greater Buddhist community would otherwise suggest. These groups are very different, even among Asian American Buddhists—Tibetan Americans generally grapple with a much different set of challenges than Japanese Americans—but it’s astonishing how the barriers to publication affect them all together. I’d like to hope that raising awareness of the issues of Asian Americans in Buddhist publishing doesn’t eclipse the very same issues experienced by other marginalized Buddhist voices. @Sheldrake: Thank you for your question! I suppose I haven’t been using any explicit criteria—I use the term “Asian” to include writers of Asian heritage. I am fortunate to be personally acquainted with several of the writers, and I rely on biographical information wherever possible. As it happens, this sort of information is widely available—writers often include personal details in their published work. To a lesser extent, I use guesswork—so for example, I guessed that Kelvin Chen from Hacienda Heights (a 36% Asian community) is Asian—and when in doubt (Eileen Weintraub from Seattle), I default to non-Asian. Methodology is mentioned on Dharma Folk in posts from December 2008 and March 2009, where I mention the examples above—although it doesn’t quite get to what you’re asking about here. @Adam: I’m not sure I entirely understand your comment. The NFL anecdote was to make the point that a watered-down affirmative action policy—one is required to merely interview, not hire, a minority candidate—coöccurred with an increase in the number of African American head coaches. There are two indirect conclusions that I lean toward. 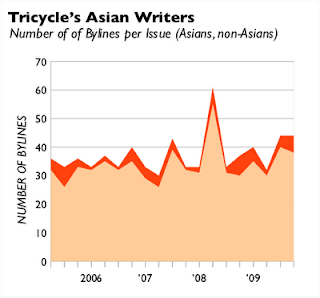 Extending the second point, an affirmative action program at Tricycle might likewise increase the ranks of Asian American contributors (not to mention other under-represented groups). There are different ways to frame such a policy, but one might be—to expand on Maia’s comment—for Tricycle to require interviewing at least some Asian American (or more generally, underrepresented) candidates for any position. @jizochronicles: Thank you for your unique input on this topic! Indeed I’ve been heartened that the Buddhist Peace Fellowship has been bold enough to address racism and diversity head-on in several of its issues. I was equally impressed that they hosted online essays by Mushim Ikeda-Nash (“Stories We Have Yet to Hear: The Path to Healing Racism in American Sanghas”) and Rev. Alan Senauke (“On Race & Buddhism”)—very forthright discussions of race and Buddhism, which I sincerely appreciate and which also greatly influenced my understanding of the issues. It’s a pity that these articles were deleted at the time of the revamp of the BPF website. @Jaeger & @Firehorse: Thank you very much for your kind comments of support. I deeply appreciate it. "institutionalized racial inequality—and by proxy the notion that white dominance among coaches is not due to some sort of inferiority among African American coaches. Second, that the issues surrounding white dominance at Tricycle are similar to those at the NFL. (You seem to disagree here, but I’m not exactly sure how.)" I disagree because The NFL was a blatantly racist organization for a vast majority of it's history. I don't believe that Tricycle is. It was for a long time (as I mentioned) a Good ol' boys league (good ol' boys aren't black). Only very recently has anything changed. How many black quarterbacks were there before 2000? 1990? The reason is that White coaches told them they were too dumb to be quarterbacks (some of this started in HS and College of course). Same thing with the coaches. Call it blatant institutional racism if you want, but there wasn't anything passive about it. There was no "I guess I didn't realize I was being an accidental racist by not including African-Americans". It was the industry standard. Thankfully, QBs like McNabb and coaches like Tony Dungee and Mike Tomlin proved everyone wrong, and now race is no longer an issue at the QB or coaching position. And thankfully, someone woke up and instituted the Rooney Rule, or the racism of the old guard of the NFL would have been free to continue business as usual. I see your point when you speak about the good that came from forcing the owners to interview coaches of color, and how Tricycle might benefit from this, but don't for a minute chalk the racism of the NFL to "institutional racism" as it was anything but. This discussion appears very emotive for you. I would otherwise not reply, but for a single logical oversight in your response that I feel compelled to address. Your are entirely accurate to say that outright (in your terms, “blatant”) racism has been ingrained in the NFL, and also that an integral part of the system was a belief that African American players were intellectually inferior. The underpinnings of this dynamic are more intricate than your words assert, but that’s besides the point I’m trying to make here. The problem is that the very nature of the Rooney Rule does nothing to remedy outright racism. The Rooney Rule requires that teams merely consider minority candidates, not hire them. On top of that, the rule includes stipulations allowing teams to even forgo the minority interview requirement in specific situations. The outright racist has no obligation under the Rooney Rule to hire an African American player. If the NFL in 2002 was truly chock full of flaming racists—and by racist, I mean people who feel that African Americans are inherently inferior—then no change would have occurred. Our divergent opinion here crucially hinges on our divergent understanding of racism. From your response, I honestly doubt you understand what constitutes institutional racism. I assert that the situation for both the NFL and Tricycle involves a mix of white privilege, implicit bias, institutionalized racism and flagrant racism—though the nature of that mix need not be the same. Are there flagrant racists in the NFL in 2003? Perhaps—I have no hard evidence one way or another. But they wouldn’t explain why the Rooney Rule worked. I’m going to have to amend my last comment on “a mix of white privilege, implicit bias, institutionalized racism and flagrant racism.” I miswrote. Institutionalized racism, at least as I experience it, itself involves a mix of privilege, implicit bias and structural disincentives. Having grown up in one of the most segregated cities in America (and flagrantly racist, and home to more hate groups than any other state in the union) and knowing quite a few athletes that were both white and of color (many of which were collegiate athletes, and quite a few of which are professional athletes now ), I have only my experience and their first hand accounts of the flagrant racism they've run into (NFL, NBA, NHL and their minor leagues). I also know of how easily my white friends that became pro athletes have gone into coaching and leadership positions. But maybe there is evidence to the contrary on a larger scale. I just know that it hasn't the experience of those that I've known over the years.